The rebound effect, Achilles’ heel of energy efficiency? | Energy 3.0 : the webmagazine about energy efficiency. The rebound effect, Achilles’ heel of energy efficiency? Today the energy world is facing three major challenges. First, growing global energy demand, mostly driven by developing countries, and the increasing scarcity of resources inevitably cause a rise in energy prices. Second, growing environmental concerns and ecological awareness push for an overhaul of existing energy production systems, allowing for a higher share of renewable energy sources in the mix as well as a cut in greenhouse gas emission. Third, the recession puts a burden on household, business and public budgets and is an incentive to reduce energy consumption. In this context, energy efficiency is increasingly considered by experts and policy-makers worldwide as a means of achieving the necessary transition towards sustainable energy systems. 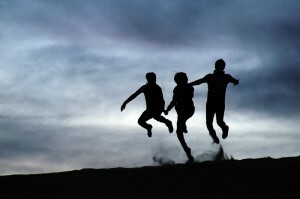 By reducing energy production needs, thus making renewable sources more viable; by cutting energy bills for countries as well as consumers, therefore fighting fuel poverty; and by lowering final energy consumption, thus mitigating some greenhouse gas emissions, among other things, it seems that energy efficiency can only be beneficial. However, its strength can prove to be a weakness, since by enabling users to cut their energy bills, energy efficiency actually often allows for higher final energy consumption levels, due to the so-called “rebound effect”. In economics, the rebound effect (or take-back effect) refers to an increase in consumption of a good when its price goes down. In other words, the saving resulting from lower prices is partly or even completely offset by excess spending. 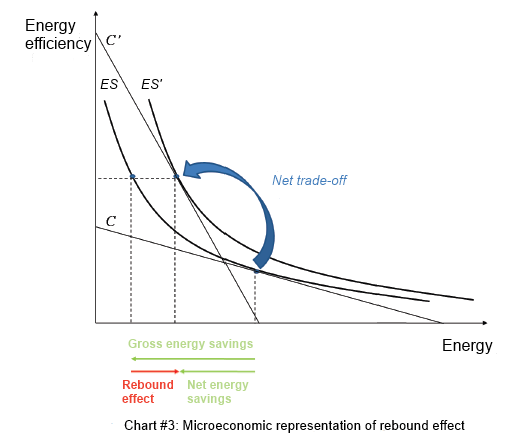 Since the 1980s and the Khazzoom-Brookes postulate, the rebound effect has been used in energy economics: higher energy efficiency paradoxically drives energy consumption up, thus offsetting all or part of the expected saving. In the chart below, the rebound effect is accounted for by the shift in energy service (ES) isoquant curves from ES to ES’ following the shift in budget constraint curves from C to C’ induced by an increase in energy efficiency. The difference between expected gross energy savings and net energy savings equals the rebound effect. In practical terms, it means that, for instance, one would heat their home more after buying a more efficient heater. Source : GIRAUDET, « Les instruments économiques de maîtrise de l’énergie : Une évaluation multidimensionnelle », 2011. Increasing energy efficiency can also entail indirect rebound effects; although these take various forms for households, businesses or the global economy, they all refer to an increase in energy expenditure outside the area where energy savings were achieved in the first place. For instance, the energy spent in order to produce consumption goods whose purchase was made possible by savings resulting from the increasing energy efficiency of other goods is an indirect rebound effect which partly offsets the expected gross energy savings. In France, active energy efficiency in the tertiary and residential building sector (which makes up the second largest energy spending area next to transportation) could help save between 13 and 20 billion euros with current technology, and even more in the years to come. Relying on automated energy consumption monitoring systems, it could also offset all or part of the abovementioned rebound effect. Contrary to other energy-spending sectors such as transportation, energy consumption elasticity in the building sector is rather low. In other words, consumers are more prone to using alternative means of transportation in order to drive fewer miles per year and save money than, say, turning the heat on fewer days. In this context, the direct rebound effect that can be observed in energy consumption in buildings depends less on how much the need for energy service is met (i.e. the answer to the question: “Is my home warm enough?”) than on behavioural shifts due to a lack of attention or sluggishness (McKinsey Global Energy and Materials, 2009): except for the poorest households whose energy service needs are still unmet, it is as though a lower energy bill encouraged users to waste more energy, for instance by leaving the heat on with no one home or a window open. A 2009 study by French consumer research centre Crédoc showed that budget concerns prevail over environmental concerns in households’ choice to cut energy consumption. As a consequence, when the budgetary constraint is removed, energy-saving behaviours are abandoned. Active energy efficiency, by empowering users and turning them into active players, aims at fighting the rebound effect and making energy savings last, via active monitoring systems regulating consumption areas such as heating, hot water, air-conditioning or lighting.